I see that I can enter my hunting areas with expert GPS and did see some farm capabilities. How easy is it to put fence lines and gates on the maps? Can I pull in a Google Earth image and draw directly on that? Can I add and remove layers? example, maybe I don’t want to see the deer trails, can I hide them and then view them again later? Thanks for your help! It’s as easy as pointing and clicking. 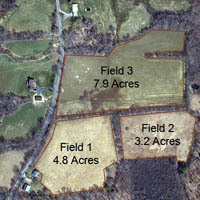 You can trace fence lines directly off the aerial imagery of your fields. ExpertGPS does have a Layers feature, but even easier is to simply hide the data you want to temporarily remove from the map. Select the data, right-click, and Hide. When you want to see it all again, click Show All on the Edit menu. The View in Google Earth command in ExpertGPS allows you to view your GPS data (waypoints, routes, and tracks) over the detailed color imagery in Google Earth. To use the command, open a GPX file in ExpertGPS, or retrieve the data from your GPS. Press F7, or click View in Google Earth on the Go menu. ExpertGPS will instruct Google Earth to synchronize its map to match the map in ExpertGPS, and to show your GPS data. If Google Earth is not already running when you click View in Google Earth, it may not show your data because it is busy initializing. To prevent this, run Google Earth and let it finish initializing and zoom in on the globe. Then click View in Google Earth in ExpertGPS. You can also export your data from ExpertGPS to a KML file, which you can then view in Google Earth. Click on the map in ExpertGPS, and then click Export Data on Map on the File menu. Change the file type to .kml, and save to your desktop. Open the KML file in Google Earth. The ExpertGPS help file has complete details about preparing and geo-referencing your maps for use within the program.